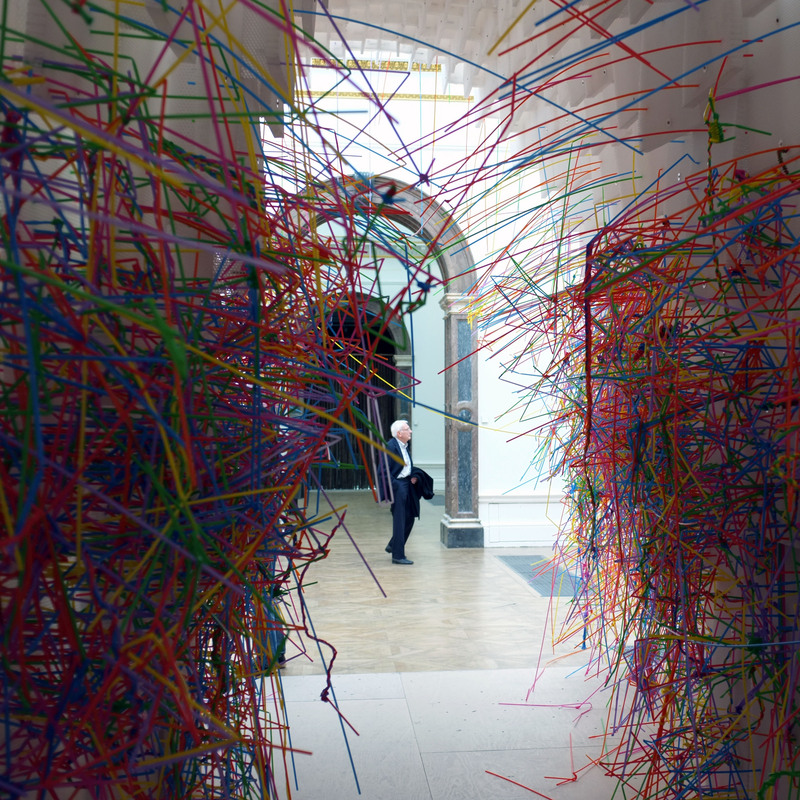 Yesterday I went to visit the Sensing Spaces; Architecture Reimagined exhibition at the Royal Academy of Arts. 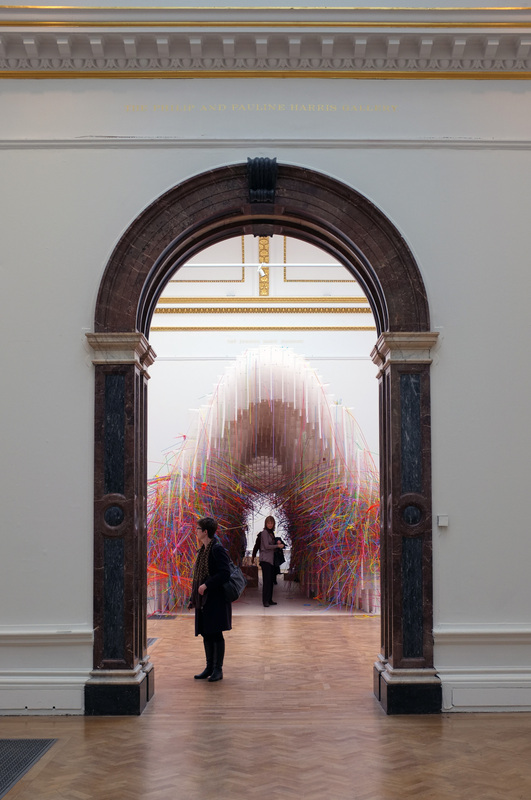 Seven architects from around the globe were invited by curator Kate Goodwin to create a series of architectural interventions at Burlington House. The strength of this show lies in its full-scale interactive installations, rather than relying on traditional (and often inscrutable) forms of architectural representation. The installation by the Chilean studio Pezo von Ellrichshausen occupies the largest gallery space, directly off the octagonal central hall. For me it was the star of the show, and I found myself revisiting the room after I’d made my way through the rest of the exhibition. Most of the large space has been left unoccupied, with a small platform at one end raising the visitor high into the coved ceiling, directly under the huge rooflights. The platform is raised on four fat, timber-clad columns, which conceal spiral staircases within. Only two materials are used throughout, timber for the cladding and structure and steel for the fixings and delicate black handrails. 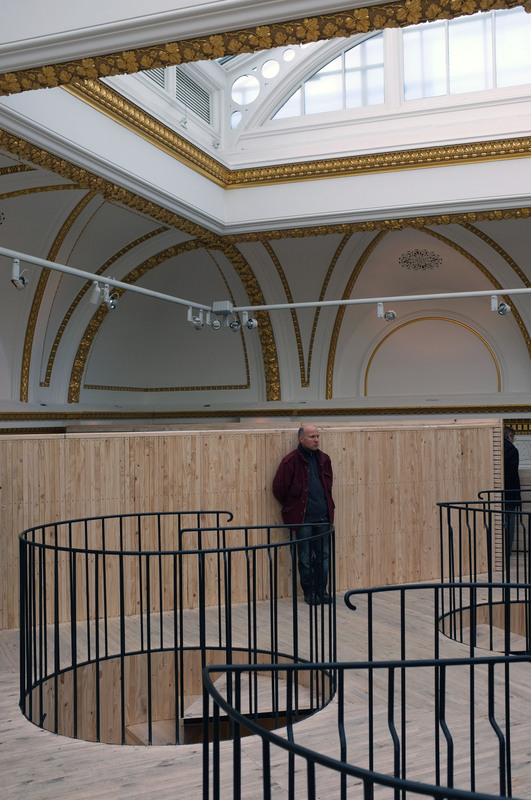 The small size of the platform requires proximity – in contrast with the generous gallery below – you have no option but to squeeze past other visitors and engage with the boundaries of the space. By elevating the visitor, and screening the gallery below with a high and solid balustrade, the ornate, gilded plasterwork of the deeply coved ceiling, traditionally seen at a distance is brought within arms reach. In the final room of the show, there is a video titled ‘Meet the Architects’ where each of the architect’s describes their approach. Here’s a snippet from Mauricio Pezo; “Good architecture is often invisible, but allows whatever is happening in that space to be the best experience possible” – I couldn’t agree more! I had read a few reviews of the exhibition before visiting, and the installation by Diébédo Francis Kéré does not seem to have been well received by the architectural press. The guardian’s Oliver Wainwright described it as having ‘the air of a scrappy student project’. I totally disagree – it seemed to me that the structure was very deliberately imperfect and unfinished. Visitors are invited to add to a rather basic structure of honeycomb polycarbonate with colourful plastic straws. The result is a joyful, interactive and playful intervention that engages the public in the very act of creating architecture. The colourful additions are not just creating the façades but they are also shaping the space – forcing visitors to move in different ways through the space. The structure occupies two galleries, and is has been shaped to create a flow from one gallery to the other, with a narrow pinch point in the middle to ‘bring people together’ as Kéré puts it. I think we can learn a lot from this African architects’ approach to simple self-build technology. Here as with his buildings, simple and modest elements have been combined to create a beautiful and meaningful ‘communal’ composition. 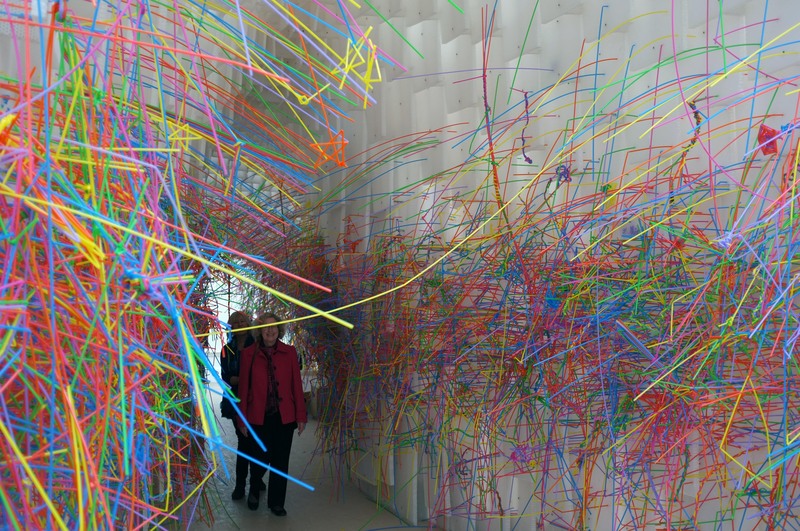 Kengo Kuma’s installation spans two galleries. A fragile lattice of scented bamboo creates a towering and beautifully intricate structure in the centre on the first room. The rooflights have been closed and the only light is provided by small uplighters, which illuminate the slender bamboo members. In the second space a ‘ma’ or void space has been created, where a similar bamboo structure hangs from the ceiling like woven stalactites. The bamboo in the first structure is scented with Japanese Cyprus oil and the bamboo in the second room has been scented to recall the smell of the tatami mat. 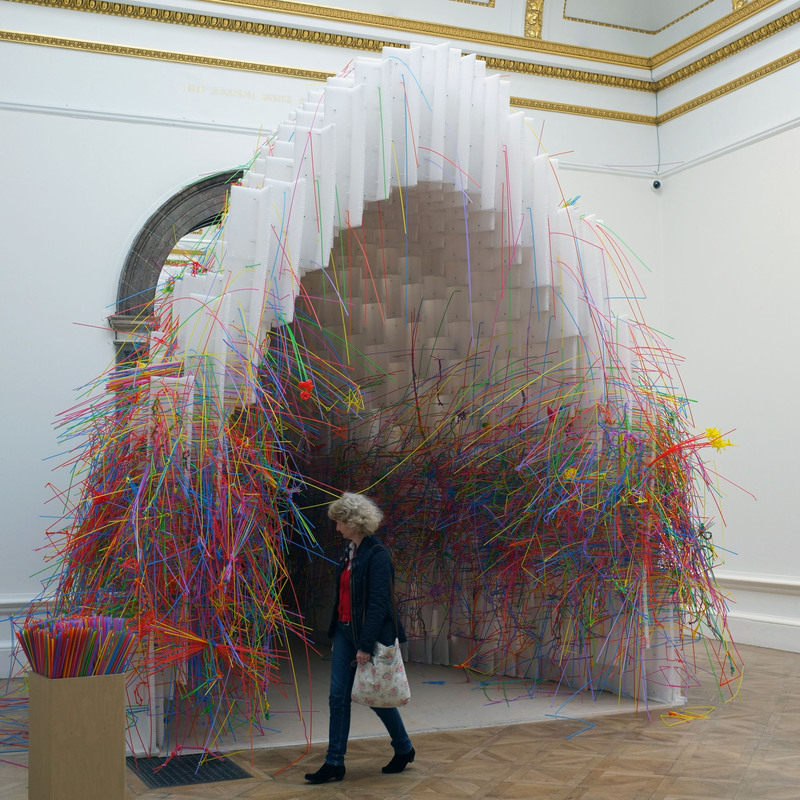 Although visually interesting and sweet smelling, the flimsiness of the structure creates an uncomfortable sensation – you are afraid to really engage with it, or touch it in case the whole thing collapses! The sense of touch has been forgotten – for this reason it lacks the impact of the other installations. Inside, Souto de Moura has produced 2 facsimiles of the framed openings between the gallery spaces, also realised in reinforced concrete. First we encounter a reproduction of the polychrome marble arch leading from the central hall to the sequence of galleries to the North. Here the arch has been picked up and pivoted into the first gallery. This simple gesture is surprisingly powerful, disrupting the orientation of the gallery. Later the same trick is played on the wooden portal between two galleries creating a new discordant axis to the enfilade of spaces (see feature image). Before the exhibition I was unaware of Li Xiaodong’s work. The Chinese architect is fascinated by interiors, and sees his architecture as a ‘container’ for human life. His installation combines two equally sized galleries into one ‘defamiliarised’ environment, completely at odds with the central London site. You enter the space through a curtain of dark cloth, finding yourself in a labyrinth of sorts. High walls, constructed of hazel twigs define narrow paths with a glowing floor providing the only lighting. You quickly become lost in the dark space, finding three small and blank plywood rooms among the forest of twigs. Eventually the meandering path leads you to a large zen garden. Here the crunch of pebbles underfoot combines with the smell of the hazel twigs to create an inward focus and a very calming space. 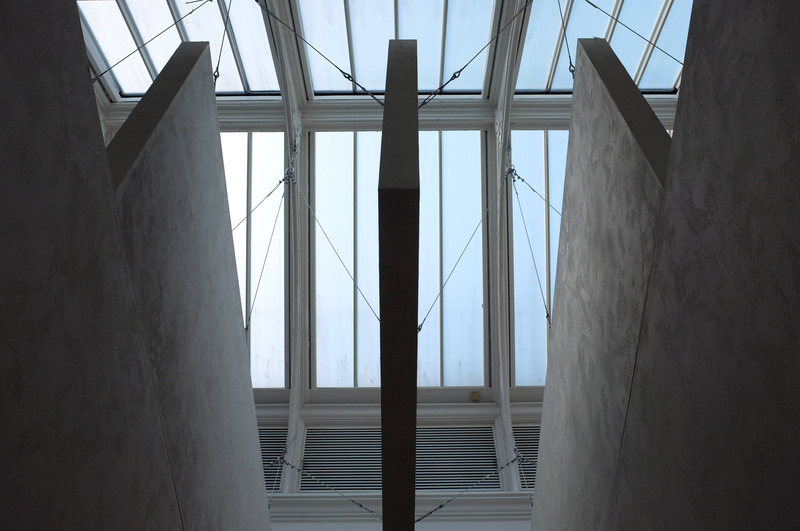 A mirror to one side of the gallery extends the space creating the illusion of a large rectangular garden set perpendicular to the axis of the existing gallery. Filtered light enters the garden from the perimeter pathways, through the open twig walls. After the semi darkness of the Xiaodong’s you are released into the lightness and brightness of the first of two rooms taken over by Grafton Architects. They clearly understand the pleasure of moving from lightness to darkness and vice versa. Both spaces are top lit by generous rooflights, which they have used at their site and created two very different spaces. In the first space a series of bright white baffles create a low but porous canopy. The space feels light, airy and calm – a long bench along one wall allows visitors a moment to rest and enjoy. In the second room they have made use of the increased height to explore sensations of weight, darkness the sublime. They have ‘ plugged into the void’ with a large wooden structure, finished to resemble concrete. Diagonal cuts in the structure introduce a new axis to the gallery – guiding views between two benches in the corners of the room.